There is no need for me to rehash the actual times from Practice Sessions 1 and 2 - they're all over the net (Grand Prix dot com is probably the most comprehensive). My five-hour handicap is a bit difficult to overcome unless I want to stay up all night; but I do have an advantage over the Europeans in that I have more time for reflection and identification of trends before I rush into print. So here goes. Naturally, I am going to crow about the Ferrari worshippers who expected the red team to walk all over the opposition this year. It hasn't happened yet and, I predict, it is not going to happen. The McLarens looked a good deal more comfortable at speed than the Ferraris and Hamilton showed that he was not just a flash in the pan last year. Sure, it's a lot to say after just one day of the season but take a look at what the Ferrari boys themselves are saying - it's a chorus of consternation, a sudden retreat from the triumphalism of the off season. They have just as much work to do as anyone else in competing with the monster of their expected form. Compare that to the quiet satisfaction in the McLaren camp. These guys are motivated beyond ever before and the trials of last year play a big part in that. They may never say "I told you so" but they are determined to wash away the taint of suspicion with the detergent of victory. Not that they will have it all their own way. Ferrari do have a quick car and the WDC in Raikkonen. And I would direct you to the comments of Mario Theissen and his assertion that everything went according to plan. Have we forgotten already that BMW never go for quick times on the first day? Come qualifying they will be in the mix. Williams had a disappointing day, beset by niggling little problems that prevented their giving a true account of themselves. They are likely to move up the order tomorrow. And Toyota are just as likely to progress downwards - I'm sorry but I just cannot see them as better than midfield runners. And so to Red Bull. 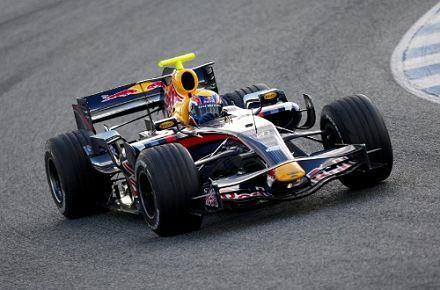 Mark Webber maintains that we should not get excited by his second fastest slot in Practice 2 - light tanks, he claims. To which I reply that everyone had a go with light tanks (except poor Super Aguri who were still in the throes of poverty). Mark must take the consequences of being so quick, especially as Coulthard was not far behind him - we expect RBR to do well, although they will probably not last the race. Otherwise, things were pretty much as I expected. Honda did better than they were supposed to, Renault did worse. Even Fisichella's astonishing ninth quickest time in the Force India was predictable from his performance in testing. Perhaps it is time for someone to point out to Adrian Sutil that coming close to a McLaren contract means nothing once the season begins. Nice take on the situation, Clive. It's great to see Kovalainen up in the top 4. Kind of makes Mr. Six-Tenths look a little silly, especially considering his times this year. Take away Alonso's performance and I think we have a true picture of how good the Renault is this year - no better than it was in 2007, relative to the others. I do expect them to improve with time, however. As much as I dislike Alonso as a person, I think he does give good feedback to the engineers and they will get the car sorted the more quickly thanks to that. Fernando is unlikely to get a podium finish this season, however. Kovalainen is proving well worth the McLaren seat. He was quicker than Hamilton most of the time and not at all overshadowed. Having said which, I watched Hamilton's fastest lap and he was the driver I remember from last year - inch perfect and smooth. Kovalainen may beat him on occasion but Hamilton is the real championship contender. And I have to believe that Williams will get over their problems and be contenders too. I love reading Peter Windsor's analysis of driver's abilities in F1 Racing. He rates Lewis as a Kimi, plus a level or two. He says that on a "Ferrari" day, Lewis out-drove Kimi, but the Finn never out-drove Lewis on a "McLaren" day. Should make for another amazing year. And like I said (or am about to say) over at F1 Pitlane, Lewis improves, Kimi believes he is complete. I'm also having a bit of a chuckle about Piquet having such a disastrous weekend thus far. I take no delight on the misfortune of others, but the guy really was getting cocky and now he's finding what life with the big boys is like. I think the youngster is gong to have a pretty hard time getting back to the mental state he was at during testing. Ah yes, "Kissbutt" Windsor, as I call him. Mind you, it's not his fault - he's just not cut out to be the grid walker for a TV channel. But the way he gets so easily ignored and shoved out of the way when trying to fawn over the great and good is so embarrassing. It's a good point he's making about Hamilton and Raikkonen, though - looking at last year, there's a lot of truth in it. I am beginning to lean towards Steven Roy's view on Hamilton. This is the year when he'll confirm his greatness or prove us wrong - and the signs were good in the Practice Sessions, especially P2. We hardly saw the guy until right near the end, then he comes out on softs with light tanks and calmly puts in a time that is nearly a second quicker than anyone else's. The confidence is just amazing. As for Piquet, I think he had a pretty awful time in testing too. Alonso really put him in his place. It might be good for him in the long run, however - make him get down to some hard work and reality. And being a complete child my favourite part of the day was on the itv-f1.com highlights (only if you've got a UK IP address, I'm afraid Clive and anyone else) seeing Hamilton coming sideways out of the last corner. Agreed, DBT, good to see the cars sliding a bit again. I didn't see that shot of Hamilton but have read about it on several sites already! I agree that Windsor seems to lose his confidence and gets all soft in the knees on his pitlane walk. Maybe he's trying to be a certain way for the Speedvision crowd. I only watch quali on Speed and catch the ITV broadcast on TSN here in Canada. What I really admire is his ability to pick up the nuances in a drivers technique, to dissect a lap into it's segments of corner and how the driver handles approach, apex and exit. For all I know he's completely wrong, but since I don't have his skill and experience, I'll assume he's a genius. Well, he's been in the business so one must presume he knows what he's talking about. He is well respected as a writer too, although seems to hold a few very strange viewpoints. It's just his manner on the pit walks that I find so embarrassing - nothing like Martin Brundle just barging in! I've never had the pleasure of Brundle's pre-race. They don't show it here, unfortunately. Our domestic sports broadcaster believes that their local "experts" are superior. Vic Rauter and Gerry Donaldson know their stuff, with Donaldson having written several books on F1, but let's face it, they're no Brundle. I've read one of Donaldson's books. Villeneuve - it was one of the best. I'd be quite interested to see him pre-race, in fact. Swings and roundabout here - you may not get Brundle but you also don't get James Allen. Forgot how annoying his commentary can be until quali this morning!! I should count my blessings, huh, DBT? You're probably right - SpeedTV's team is pretty good and even Windsor is better than that lassie (I forget her name) ITV used to use in the pits (is she still there?). I really don't mind James Allen. Must have been born with an immunity. But Donaldson, despite his encyclopedic knowledge of F1, is as dull as it gets. Still, the lucky bigger gets to go to the races on someone else's dime. Probably since Vic Rauter was covering Curling, TSN gifted us with Allen and Brundle for Quali, so I enjoyed watching both. Ah yes, that's her name. She may have improved over the years so perhaps I shouldn't be so hard on her - but she was awful at first. That would be correct, Clive. The James Allen irritation factor is a question of repetition, and what you heard on the clip I suggested has been almost his entire vocabulary since Lewis Hamilton stepped on the scene. Badly need your help. There is only one success - to be able to spend your life in your own way. I am from Denmark and bad know English, please tell me right I wrote the following sentence: "Mortgage lead help, resources, and links." Thank :P insurance insurance lead.